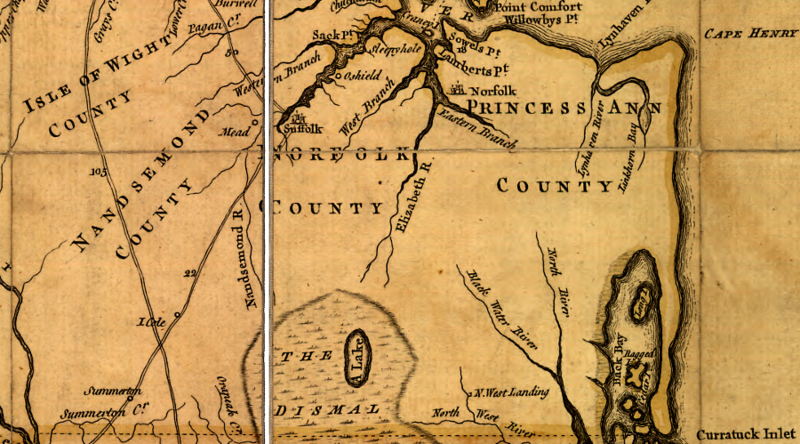 In Hampton Roads, decision-making is balkanized. Leaders in different cities and counties have difficulty setting priorities other than "my jurisdictions first." Even the coordination organizations are hard to coordinate. The Hampton Roads Transportation Accountability Commission (HRTAC), Hampton Roads Transportation Planning Organization (HRTPO), and Hampton Roads Planning District Commission (HRPDC), coordinate priorities for the region. Membership varies between those organizations. 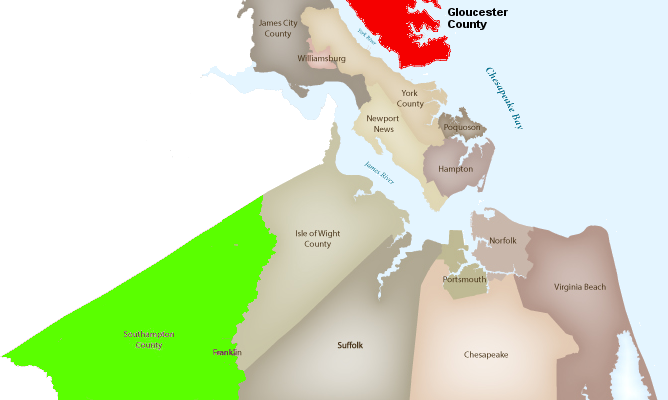 Some local jurisdictions belongs to the Hampton Roads Transportation Planning Organization and coordinate transportation planning, meeting a Federal requirement to obtain funding. Different local jurisdictions belong to the Hampton Roads Transportation Accountability Commission and coordinate transportation planning, to allocate the special revenues in the Hampton Roads Transportation Fund. Surry County's involvement in transportation planning is limited, and it has few road projects or needs that would affect nearby jurisdictions. Only a tiny portion of Surry County is crossed by US 460, one of the roads expected to be improved with revenues from the 2013 tax increases. For decades, the political conflict between "North" Hampton Roads and "South Hampton Roads" blocked efforts to get additional transportation funding from the General Assembly. 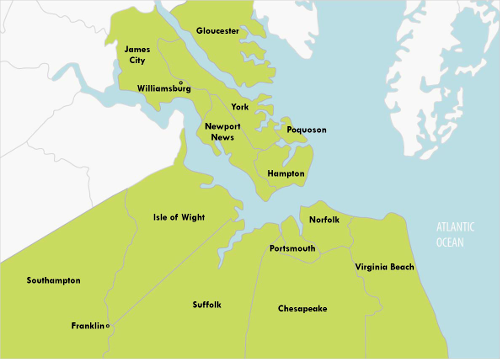 In the eyes of Hampton Roads officials on both sides of the water, Northern Virginia and other regions were able to direct transportation funding to their projects, but southeastern Virginia projects were rejected due to the lack of regional consensus on priorities. In 2013, the state legislature authorized a 0.7% sales tax increase plus a 2.1% increase in the fuel tax in Hampton Roads. The new taxes were part of a major increase in transportation funding statewide, passed in a law known as "HB 2313." HB 2313 was expected to raise $8-10 billion in additional revenue over the next 20 years for the new Hampton Roads Transportation Fund. In 2013, the governor and legislature found the political compromise needed to raise taxes for new transportation projects, and did so consistent with the Constitution of Virginia. 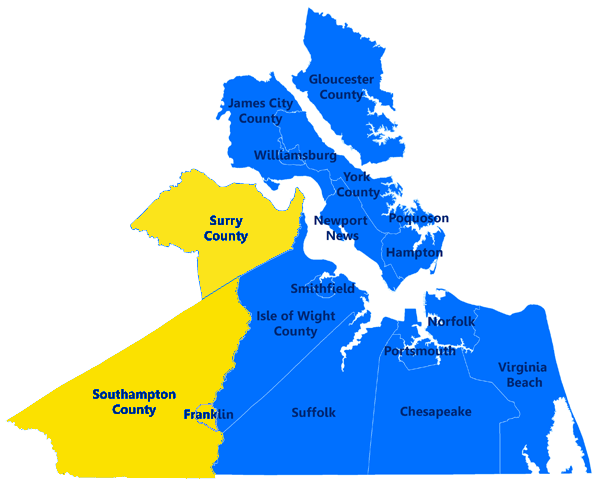 The legislature approved new taxes for the Northern Virginia and Hampton Roads regions in HB 2313, but Richmond and nearby jurisdictions in the Central Virginia region were unable to cooperate and get that authority for new taxes. The state legislature gave the Northern Virginia Transportation Authority, a regional organization created in 2002, authority to allocate funds to regional projects in that area. 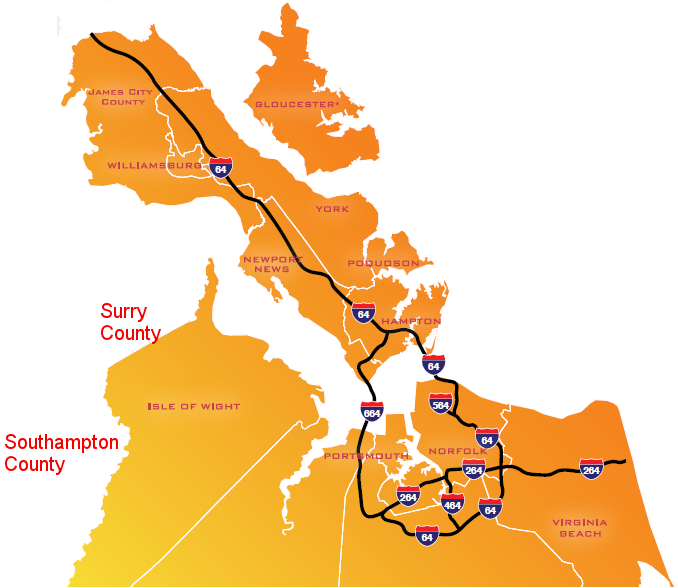 An equivalent Hampton Roads Transportation Authority had been created in 2007, but it had been abolished after the Virginia Supreme Court blocked the 2002 effort to raise regional taxes for transportation. After passing HB 2313, the General Assembly could have given the Hampton Roads Transportation Planning Organization control over the new revenue. That organization's track record for resolving regional conflicts and making decisions on transportation priorities was poor, so in 2014 the General Assembly created a new political mechanism. The 23-member Hampton Roads Transportation Accountability Commission was given control over the new Hampton Roads Transportation Fund. The Hampton Roads Transportation Accountability Commission did not gain control over all transportation funding; the cities retained their traditional funding for maintainence of roads and bridges. The new HB 2313 taxes did re-set the political debates, however. By deciding which projects would be funded from the new transportation tax, the Hampton Roads Transportation Accountability Commission gained the power to steer decisions on new construction. The agency can also set tolls on different projects, providing a way to balance the impacts so each jurisdiction suffered a fair share. To ensure funding priorities are not too biased towards one part of Hampton Roads, the commission requires 2/3 of elected officials, representing 2/3 of the region's population, to approve projects. [N]o more blaming Richmond... No more complaining, whining, bickering. You all need to get together. This is your decision now. Make the decisions. And make them smart, make them quickly, and do it in a manner that, number one, opens up the area for economic development and, number two, eases congestion. even a coalition of the region's largest cities will still need support from their smaller counterparts as they attempt to reshape Hampton Roads' transportation network. Portsmouth in particular has felt aggrieved by the decisions of state officials. Under the state the Public Private Transportation Act (PPTA), the Virginia Department of Transportation contracted with a private company, Elizabeth River Crossings, to build a second Midtown Tunnel (as well as improving the Downtown Tunnel and extending the Martin Luther King Freeway). Northern Virginia has the cooperation to pursue projects, but can't agree on which projects to pursue. Hampton Roads, meanwhile, has nearly unanimous agreement on the projects it needs to pursue, but can't cooperate. The thing that I think separates the business community and sometimes public officials... is the business community recognizes the interrelationship that needs to exist in a regional economy... 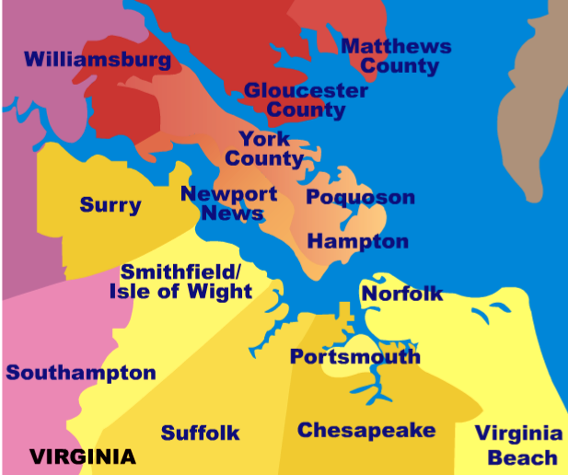 It's not like Norfolk has an economy and Newport News has an economy. It's a regional economy and it's dependent on the ability to move people, goods and services... The business community can see that. The new Hampton Roads Transportation Accountability Commission chose to create a separate staff, independent from the Hampton Roads Transportation Planning Organization and the Hampton Roads Planning District Commission. The alternative was to hire one executive director and have that person be accountable to three separate boards, an approach considered unrealistic by the state delegate who sponsored creation of the Hampton Roads Transportation Accountability Commission. 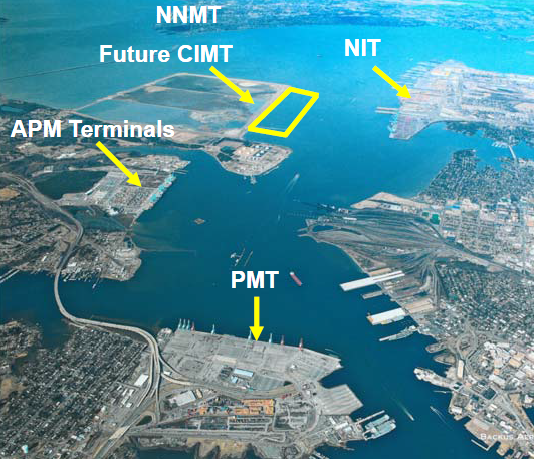 The most expensive transportation project proposed for the region is a "Third Harbor Crossing" of the Hampton Roads harbor, to connect the Peninsula to South Hampton Roads. 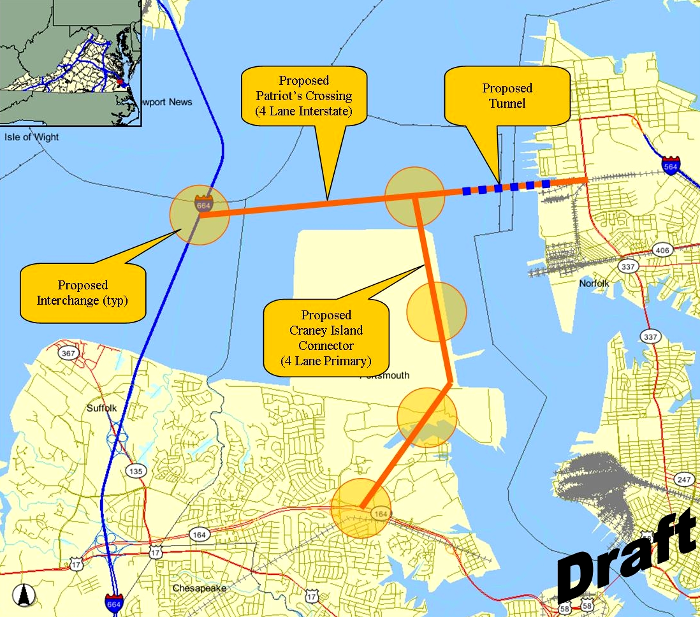 Officials on the Peninsula advocated for an expansion of the Hampton Roads Bridge-Tunnel (I-64) linking Norfolk and Hampton. 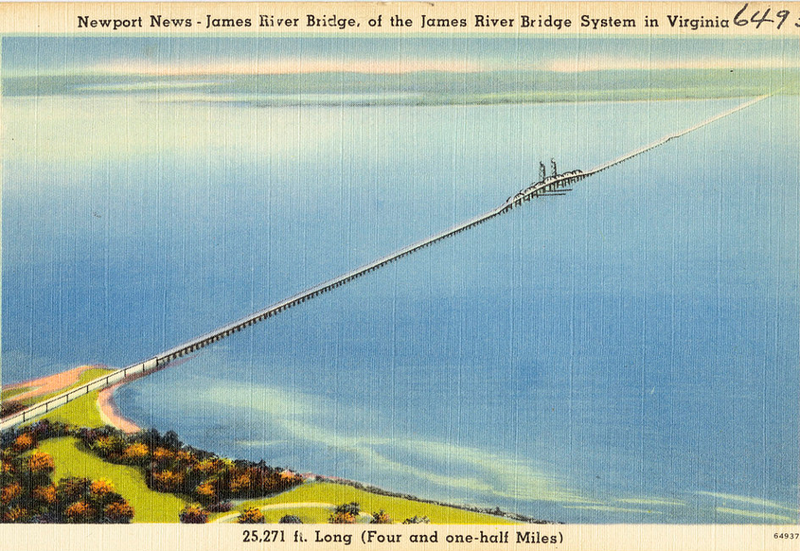 Support on the southern side of Hampton Roads was stronger for the third crossing, renamed the "Patriot's Crossing" option. 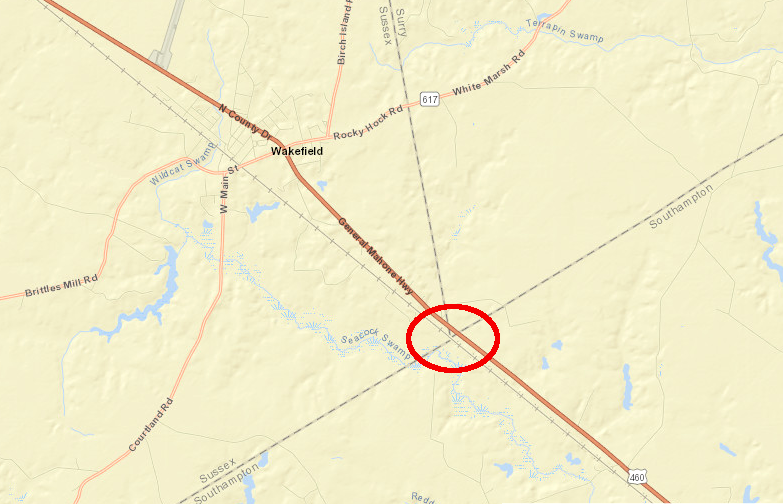 The Patriot's Crossing proposal includes an east-west bridge-tunnel connecting the Monitor-Merrimac Bridge-Tunnel to Norfolk, plus a north-south road in the middle of the new bridge-tunnel that would cross Craney Island to connect to I-64 in Portsmouth.